The villages of Kirtling and Upend lie in Cambridgeshire on the eastern edge, close to the Suffolk border and situated 5 miles south east of Newmarket. It is a quiet rural community surrounded by attractive rolling countryside and mixed woodland. The villages contain many historic buildings. To aid your walk around the parish please download the footpaths and bridleways guide. To find out what’s on in the parish please take a look at the event’s calendar. 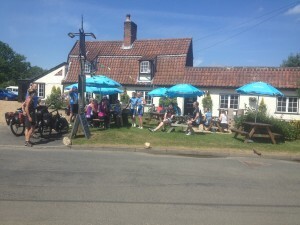 The parish benefits from a superb Village Hall and also the Red Lion pub. The Red Lion is a traditional village pub in a stunning location. If it’s a pint and a chat you’re after you’ll find good ale and a warm welcome at the Red Lion. We hope that you will find the website provides an interesting and informative account of this unique area of mid-Anglia. This website has been put together on a voluntary basis with contributions from members of the parish community including the late Doug Everitt, Penny Close, Tricia Lewis and Nick Milner. In particular, we would like to acknowledge the valuable contribution of the late Doug Everitt to the development of this site. Doug has provided fascinating first hand knowledge about the changing pattern of rural life in the area since the Second World War.